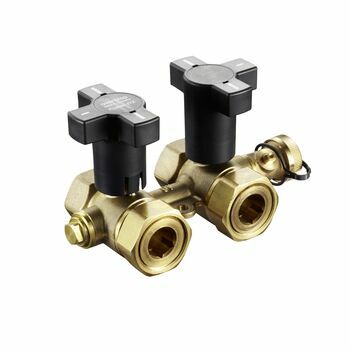 The Oventrop connection fitting "Flypass 4TZ" is used for the isolation, flushing, draining and bleeding of the supply and return pipe installed in the flow direction in front of the fitting or the succeeding sections of the system. The connection fitting can be converted to bypass operation. The ball positions and thus the flow directions are displayed by the shape of the handle. For use in central heating and cooling systems (like fan convectors (fan coil units), chilled ceiling modules, induction air systems, cooling and heating zones) with closed circuits, for operation with non-aggressive fluids (e.g. water or suitable water and glycol mixtures according to VDI 2035).